Group Discount extension allows travel agencies and tour operators to give adult as well as child group discount to their customers. Group Discount requires WP Travel Engine plugin installed. Settings for Group Discount are found under Trips > Settings > Extensions > Group Discount Settings. The setting area allows you to control the display of Group Discount. You can enable or disable Group Discount on trip/tour page. You can change the Group Discount Availability Label in Price holder. You can change the Group Discount Guide Label in Price holder. You can change the Group Discount Label in popup. You can change the Number of Travelers Label in Group Discount popup. You can change the Total Cost Label in Group Discount popup. You can change the Cost per Traveler Label in Group Discount popup. 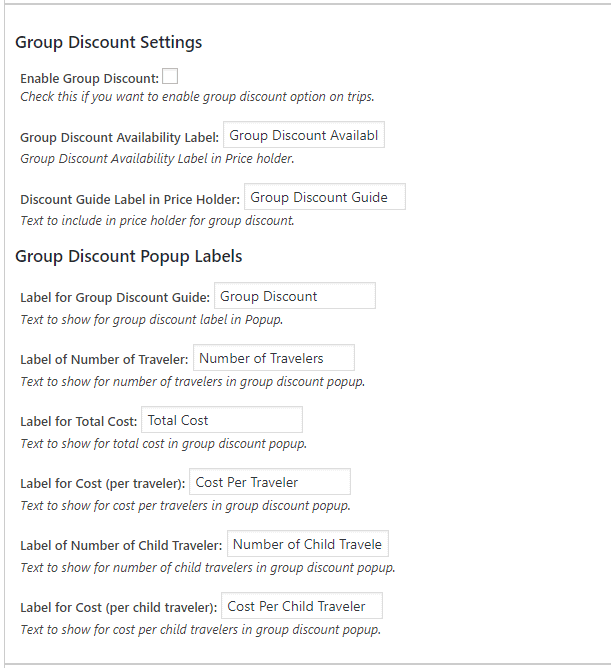 You can change the Number of Child Travelers Label in Group Discount popup. 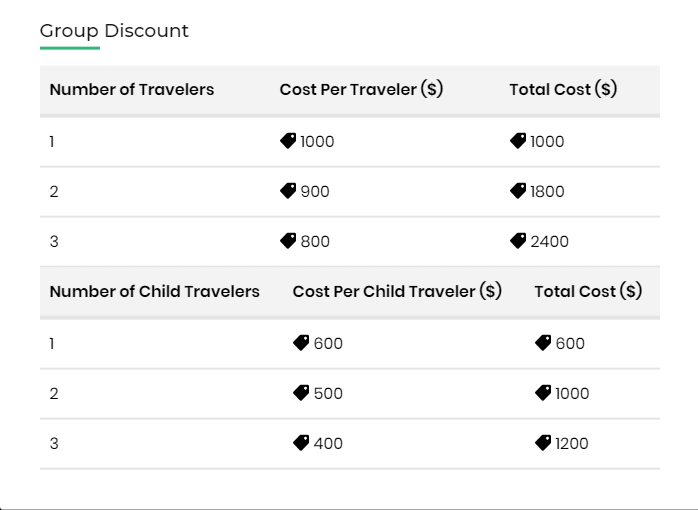 You can change the Cost per Child Traveler Label in Group Discount popup. First, find in the admin area the trip that you want to edit. Edit the trip and scroll down. You will see a meta box titled “Trip Data”. Click on General tab. You will see two sections: Adult Group Discount and Child Group Discount. Click “Enable Adult Group Discount” option to enable adult group discount. To add adult group discount, click on “Add Adult Group Discount” button. It will show two fields – Number of Travelers and Price. Enter the number of adult traveler and total price for the number of traveler. For example, if the cost of the trip per person is $1000 and you want to offer the trip at $1800 for 2 person, then enter 2 in Number of Travelers field and $1800 in Price field. Click on “Add Adult Group Discount” button to add more adult group discount. 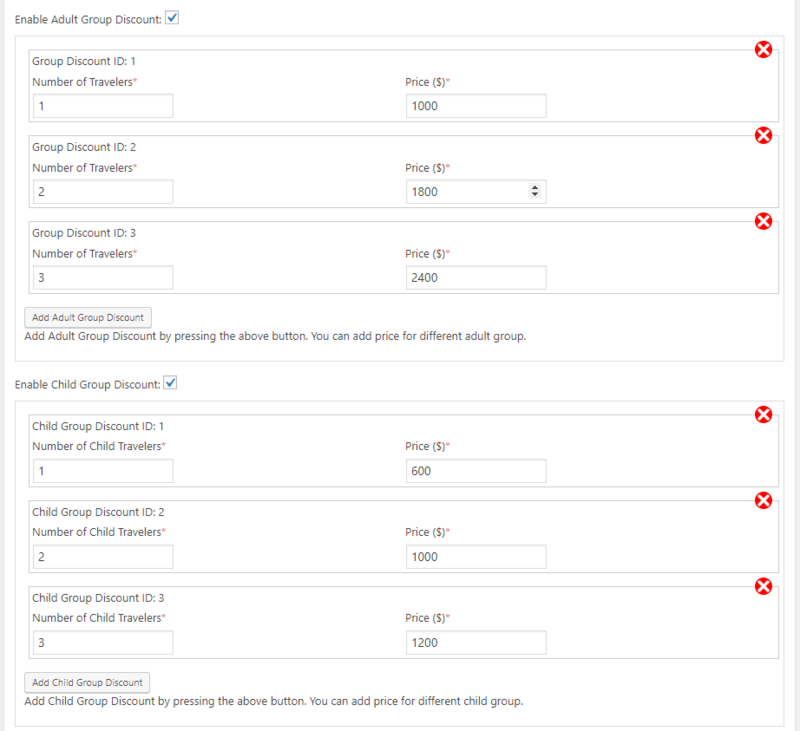 Click “Enable Child Group Discount” option to enable child group discount. To add child group discount, click on “Add Child Group Discount” button. It will show two fields – Number of Child Travelers and Price. Enter the number of child traveler and total price for the number of child traveler. For example, if the cost of the trip per child traveler is $600 and you want to offer the trip at $1000 for 2 child traveler, then enter 2 in Number of Child Travelers field and $1000 in Price field. Click on “Add Child Group Discount” button to add more child group discount. A Group Discount Available notice and a link to Group Discount Guide will be available on Trip Price Holder if Group Discount is enabled. The Group Discount Guide shows the list of adult and child discounts information.